For most of my life if you asked me to describe myself some of the first words out of my mouth would be, "I'm a dancer." I danced consistently from age 7 into my 30s, first jazz, then contemporary. As much as possible I arranged my work and graduate school schedules around dance. I joined a local company and performed to a paying audience. Then suddenly I couldn't anymore. Or not the way I had, anyway. Thanks to incorrect repetitive movements and a loss in the genetic lottery now sometimes dancing hurts (honestly, sometimes walking hurts too). And even though I've learned to adapt with better body mechanics and supportive footwear, even though most of the time it doesn't hurt anymore because of those changes (and of course regular acupuncture and moxibustion), I feel as though I'm always having to evaluate how I'm doing. I'm in my head instead of my body, thinking, "Is today an okay day? Should I be doing this step this way?" I can't just let go and move the way I used to. The point of all of this is to say that I had to contend with the challenge of how to get enough exercise only in the last few years. And after trying a wide variety of activities I finally found my new movement obsession that I can complement with occasional yoga, dance, or weights: choreographed lightsaber combat. Yes, for those of you who don't yet know me well, I am a big giant nerd, which serves me well in collecting and reading a ton of relevant medical literature as well as adoring Star Wars maybe more than is healthy sometimes. I have been obsessed with the galaxy far, far away since I was assigned homework by my seventh grade science teacher to watch at least two of the original trilogy (what were then the only) films over the Halloween weekend. All three movies were on repeat on a TV channel all weekend and right away I was hooked. Thus a love affair with Star Wars, but also with astronomy and physics took hold. My awe and excitement in my teacher's follow-up lesson on binary star systems was just the beginning; it was one of the main reasons I took a summer trading off between mission control and space flight simulations at the Advanced Space Academy (the high school version of Space Camp) and why I wanted desperately to be an astronaut. Though that's unlikely now, I still maintain it's possible (NASA, call me. We need to study the beneficial effects of acupuncture in space)! 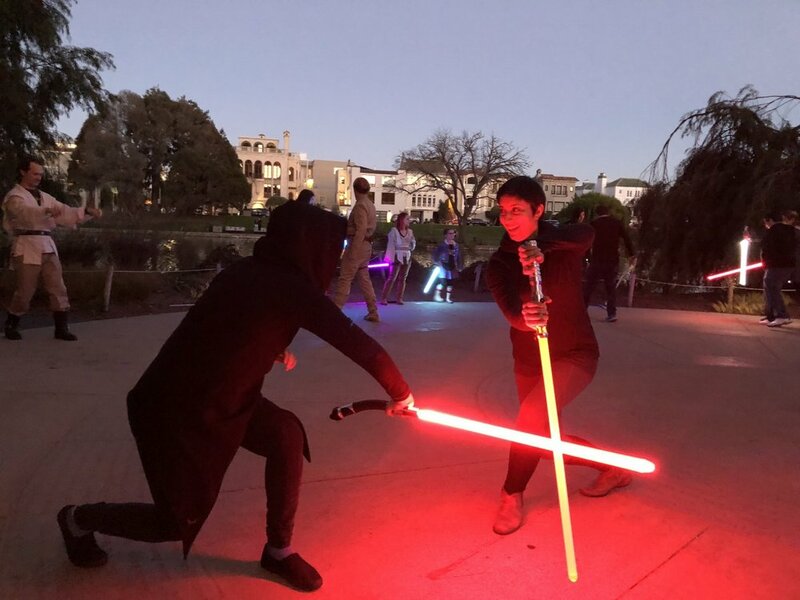 Enter an offhand comment this summer by a friend mentioning that there are Jedi exercise classes in San Francisco and my immediate decision to sign up. I was nervous to join a new community, but found them very welcoming and equally passionate. Finally a new form of choreographed exercise that builds on my love of dance, the acting, costumes, and character work I was missing from my days as a drama kid, exploring martial arts (something I'd always thought I would enjoy but never got around to), and of course getting to play around with a big glowing sword. And all this with that element I'd been missing at the gym and local yoga classes - a community. Having people who will be happy to see me when I arrive (light and fun, friendship) and bug me if I don't show up to practice (accountability) is essential. A major bonus has been getting to perform for audiences again as well! Perhaps you saw me as Finn at the California Academy of Sciences in December. My 2018 goal is to perform as Rey! So why am I talking about this here? How does this relate to medicine and wellness? Our qi is vital energy. When our qi stagnates (gets stuck), that's when we get pain. At first it might be a dull pain and we feel just a bit tight, but eventually it sets in further and that's what we want to prevent with daily movement. Many of my active patients feel terrible when they haven't had their regular level of exercise. That dragging feeling is early stage qi stagnation. To make matters worse, stress also stagnates the qi. So when we're so busy we don't have time to exercise, you're in double trouble. All the more excuse to have a spontaneous dance party at your desk or at least do a few gentle breathing qigong exercises, which I can teach you. Finding the right form of exercise can be hard. My suggestion is to do something you love that happens to be good for you rather than forcing yourself to do what you think you're "supposed" to do. If you love going to gym and lifting weights because of how it makes you feel and also you get to listen to a pump up the jams mix on your phone go for it! But if you loathe it and can barely get yourself out of bed on gym days, it's time to find something else. Go for a long walk with a friend and use it as catch up time. Bonus if it's in a beautiful green location where the color of spring leaves can help soothe your Liver and promote the free-flow of qi. Walk the long way around your block to drop off a package, giving yourself more time with your favorite podcast. Find a YouTube yoga channel with a personality and pace that suits you. Throw on your favorite song and air guitar and jump around for 2 minutes. Save your knees and punch the air in as many directions as your range of motion allows. Maybe do those arm exercises your trainer gave you years ago, but skip the weights if it's too much (or use cans). My point is simply that you have to figure out what level of activity is sustainable, enjoyable, and effective for meeting the goals you have set for yourself. Think outside the box because exercise can and should be fun. After you make movement a regular habit, then you'll find you want to slowly increase the difficulty, duration, and intensity. The most important part is doing something active regularly and having it become a seamless part of your lifestyle. So if getting more exercise is on your list of resolutions, think about what brings you joy, breathe, and let it move you. Every step toward better health counts. Curious about joining a class? Lightsaber photos courtesy of Bianca Hernandez / KQED. Newer PostWhy Is There Green Plastic in My Sushi?